The Baltimore Ravens need receivers and Zay Jones is one exciting NFL Draft prospect. 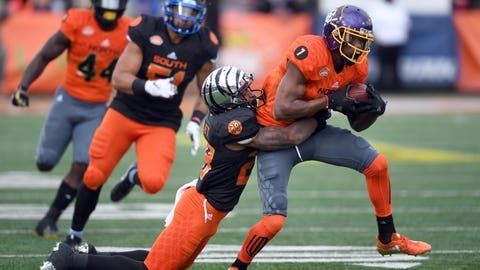 Jones put on a show at the Senior Bowl, but that’s what he’s been doing for four years at Eastern Carolina. Jones put up an FBS record 399 receptions in his collegiate career. He is a 6’1″ 197 pound wide receiver with a ton of potential and sure hands. Jones had 158 receptions for 1,746 yards and eight touchdowns in the 2016 season. In this NFL Draft class there is no better receiver in terms of yards after the catch. As a freshman he caught 63 passes. As a sophomore he had 81 receptions and as a junior he hauled in 98 receptions. Every season Jones gets dramatically better. This tells me two things. First, he is a guy who gets better every time he steps on the field. Secondly the team relied on him more and more as his career progressed. Jones reminds me a lot of T.Y. Hilton, who is a 5’9″ target for Andrew Luck and the Colts. He was a highly productive player at the small school of Florida International. Hilton was more of a deep threat than Jones is coming into the NFL. That being said Jones and Hilton have very similar bodies of work at the collegiate level. They have a similar skill set and have basically the same physical attributes. If the Ravens wanted to trade back, Jones would be an interesting player to target. Jones will probably go in the early second round. I have a hunch that there may be a team or two who will be eager to over draft Jones. He probably isn’t going to make it to the Ravens pick in the second round. Jones makes a ton of sense, late in the first round. The 16th pick however is too early to pull the trigger on Jones, who is a high risk/ high reward pick.